Choppy water is one of the challenges many beginner kitesurfers have to deal with. When you start learning to kitesurf, you often can’t choose your location and often end up learning in chop. In general, strong winds create choppy conditions in many kitesurf spots, including many river spots. Chop is something you have to cope with. So how do you kitesurf in choppy water? Getting comfortable kitesurfing in the chop takes water time. First, you need the right board to help you navigate smoothly across the chop. Most importantly, you need to learn to adapt your speed and riding angle on the fly to dampen the impact on waves. This requires subtle control of your kite and board edging. Initially, learning to kitesurf in choppy water is not so easy. Even later on as a self-sufficient kitesurfer, riding in the chop will require some experience and skills to avoid putting excessive strain on your body. Kiteboarding across real waves takes is yet another skills level. Let’s examine these in turn. As a beginner kitesurf learner, you may not have the option to learn in flat water such as a river or a lake. Many beginners take their first lessons while on vacation near the ocean. When the wind is strong chop often forms on the surface of the water, unless protected by a peer upwind for example. Doing your first waterstart attempts in choppy water can make things much more challenging for you. Your initial position for waterstart is sitting crouched in the water with your knees bent and your feet on top of your floating board, tucked in the board footstraps. Your kite is in neutral position at 12:00, as you prepare to dive it into the power zone and create traction. Before you even get your kite moving, the current may tip you sideways while you’re floating, making you lose balance with your feet coming out of the footstraps. The tiny waves from the chop get in your face and blind you, making you move your hands and tilt the bar, unwillingly steering your kite away from neutral. This may result in your waterstart failing and you having to set up all over again. You also realize you’ve drifted quite a bit downwind while this went on, so you may now have to walk back up the beach for your next attempt. 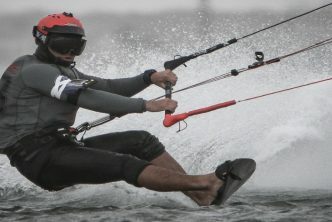 Here’s a trick to cope with chop and current when trying to do your waterstart: use kite pull to keep you balanced. You want to create a tiny bit of traction in your lines to keep you floating upright and above the chop. If your kite is positioned at 12:00, assuming there’s enough wind, pulling your bar down slightly will power up your kite just a bit without leaving neutral, and the slight upward pull in your harness will help you stay seated in the water in the right posture for waterstart. Let’s now talk about actually riding in chop. Chop often results from the wind messing up the surface of the water, or from waves that bounce off some obstacle. Cross chop is made of continuous small waves coming sideways, which generally has the hardest impact on your board and on you when riding fast. Chop that comes across from you, i.e. parallel to your direction, is not as bad to kitesurf in as your board cuts right through the small waves with a perpendicular angle. Just observing rookie kiteboarders riding in cross chop, you can feel how hard they hit those small waves as they go heads on against the chop. When I was a beginner kitesurfer, I thought the only way to ride in chop was to ignore the bumps and slam through them as hard as I could going as fast as possible. I’ve learned better since! Riding hard in choppy water using inappropriate equipment and technique can have a harsh impact on your knees, hips and lower back. Each small bump you smash with your board sends a shock up your skeleton. Older kitesurfers are typically more sensitive than younger ones and often prefer to shorten their choppy sessions. Soon after I began kitesurfing, I started having chronic pain in my knees and hips to the point I had trouble walking and climbing stairs for 2 or 3 days after each session – my local spot is always full of chop. Strong rocker, i.e. lengthwise curvature (lower in the middle than at its ends), minimum 50mm drop. A board with a very convex bottom has its edges lifted up in the water, helping it cut through the chop and smoothening the ride. A rounded profile (ellipse style) vs a square one: squared edges catch in the bumps, while rounded edges just glide through them. A tapered outline: also helps the board slide smoothly in the hardest chop. Some amount of flex, particularly at its tips. A flexier board dampens the impact from the water bumps and makes it easier on your joints and spine. Good examples of popular boards that are well-suited for hard chop are the Nomad TT and the Ocean Rodeo Mako. There are some caveats, however: boards with a convex bottom and rounded shape require more power and/or floating surface to start sliding and to stay upwind. Therefore, if you do get such a board for choppy conditions, make sure to choose a larger size than your usual (squared) board. Or, plan on using a bigger size kite than you normally would for a given wind speed. If you’re driving fast and the road gets bumpy, the first thing you do is slow down to reduce the impact of the bumps on your vehicle and on the passengers. The same applies to kitesurf! When you come across a highly choppy zone in the water, the best thing to do is reduce speed. Reducing speed when kitesurfing requires good control of your kite and your riding course. In moderate wind, you can simply release your control bar a bit, and steer your kite closer to zenith position in order to reduce line traction. In stronger winds, reducing speed may also require you to edge upwind harder. The more you edge up against the wind, the more speed you shed. Generally speaking, when riding your kiteboard goes perpendicular to the wind. When entering a zone with chop, however, particularly side chop, you need to reduce the leg pushing pressure on your board a bit to lessen the impact from the bumps – hard edging in cross chop is results in high repeated impact. The secret of riding smoothly in choppy water is to release some edging pressure and “go with the wind” momentarily as you come across bigger bumps. So as you’re about to hit a choppy area, you look ahead and examine the upcoming bumps. Right before hitting a bump, you release some leg pressure and some tension in your lines and start riding downwind for a moment as you go over that bump, bending your knees to better absorb the small shock. Going over bumps with a lower angle to wind direction will enormously smoothen the impact of the chop on your body. If you’re new to kitesurfing, you may wonder how can chop affect jumping, since you’re flying in the air anyway! Practicing jumps in agitated water is challenging because of jump setup and landing. In order to jump high, you first need to create very strong tension in your lines by edging your board very hard upwind for a couple seconds at the same time as you dive your kite into the power zone. When you have maximum tension you pulling on your bar and pop up like a spring. While this edging step is crucial to getting big air, in choppy water, a bump will often get in the way and keep you from really edging the board before you pop. What most kitesurfers do to work around this is to scan the water surface ahead and try to spot a relatively flatter zone/moment with no big bumps, and set up their jump exactly in that zone. This requires initiating the hard edging a few seconds before getting to the right place, so precision is important. The other challenge rough waters raise for jumping for less experienced kitesurfers, is during the landing stage. Newer riders tend to land their jumps with an angle to the wind instead of fully downwind. This results in a less than smooth contact with the water. Cross chop can really add to that impact, sometimes resulting in injuries. The solution is to practice landing in a full downwind direction, re-diving your kite into the wind before you land. Master the landing will make the chop must less relevant. Of course, this takes time to learn. Your best bet is to practice your jumps in smooth flat water, even if that means driving further from where you live. Once you master these techniques you’ll be able to perform them safely in any conditions. Riding in chop requires a good mastery of your kite and board, and instant actions to power/depower the kite and modify your riding angle in relation to the wind and wave bumps. With time, you will perform these actions without thinking. Water time is key to building these skills. In the meantime, try to choose the right board and kite size to help lessen the impact of hard chop on your body.